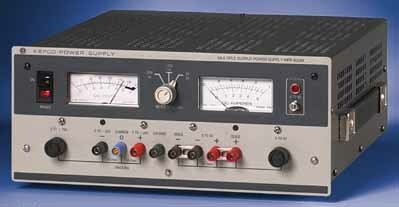 The MPS is a 70 Watt, triple output power supply specifically designed to meet the needs of IC/microprocessor experimenters. It is actually two linear (series pass) power supplies in one. The first has a single 0-6V, 0-5A output backed up by an adjustable current limiter and overvoltage crowbar for digital work. The second has two tracked outputs, 0 to +20V and 0 to -20V, both rated at 0-1 Amp. The two power supplies are completely isolated from each other, sharing only the front panel meters and the chassis. The 0-6V output is continuously adjustable with a front panel 10-turn control and is backed up by a fixed, rectangular current limit set to ~110% of maximum current. It is monitored by an overvoltage crowbar controlled by a locking type screwdriver adjustment on the front panel, setting range: 4 to 8V d-c. A crowbar ON LED is provided for convenient setting of the crowbar level. Optionally, the front panel knobs can with replaced by locking-type screw-driver-adjustable controls by specifying models with suffix "L."
The 0 to ±20V outputs are continuously adjustable with a single 10-turn front panel control. Tracking is better than ±1% +10mV. They are equipped with adjustable current limits. Adjustment range is ~10% to 105% of rated current. The 0 to ±20V outputs can be used in series to provide 0-40V (but not in parallel, since they share a common center terminal). Both sections of MPS 620M have the capacity to sustain short circuit current indefinitely. Two large (2-1/2") front panel meters display Volts and Amps for any of the three outputs, as chosen by a 3-position switch. Convenient front panel binding posts offer easy connection to your experiment. Rear barrier strips are provided for more permanent installation.